This time of year, I can feel my skin getting dry, uncomfortable and extra sensitive. I love coating my skin in luxurious, natural moisture but also want products suited to my particular skin type. Honey Girl Organics has some great skincare products that come in varieties geared toward sensitive skin. They can cleanse and hydrate your skin all the way through winter. Today we'll take a look at the entire skin regimen I have been enjoying lately, starting with the Facial Scrub and Face & Eye Creme. Honey Girl Organics products have organic honey, organic beeswax and organic olive oil. 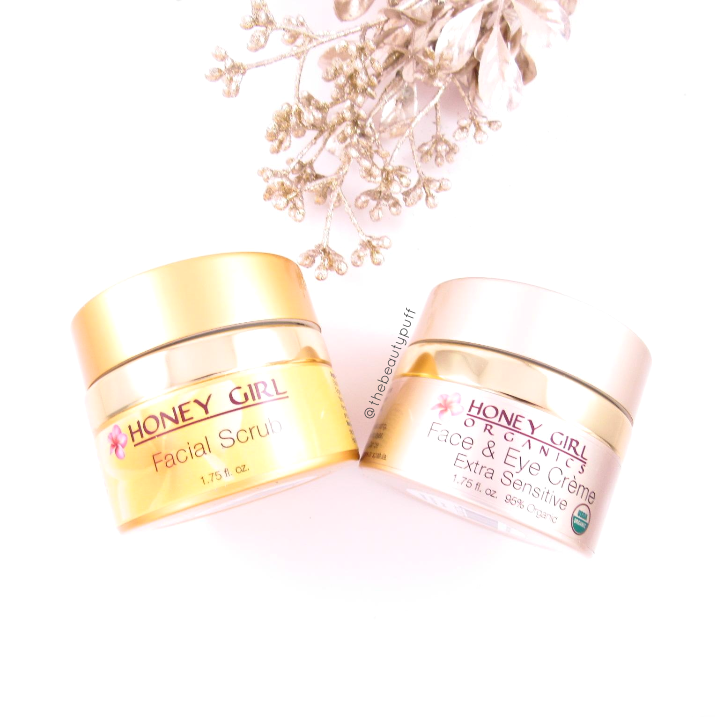 The honey and beeswax are natural anti-oxidants and anti-inflammatories that also provide skin with vitamins and minerals. It is a lot of natural goodness for your skin! All of their products are non-GMO and of course, cruelty-free! 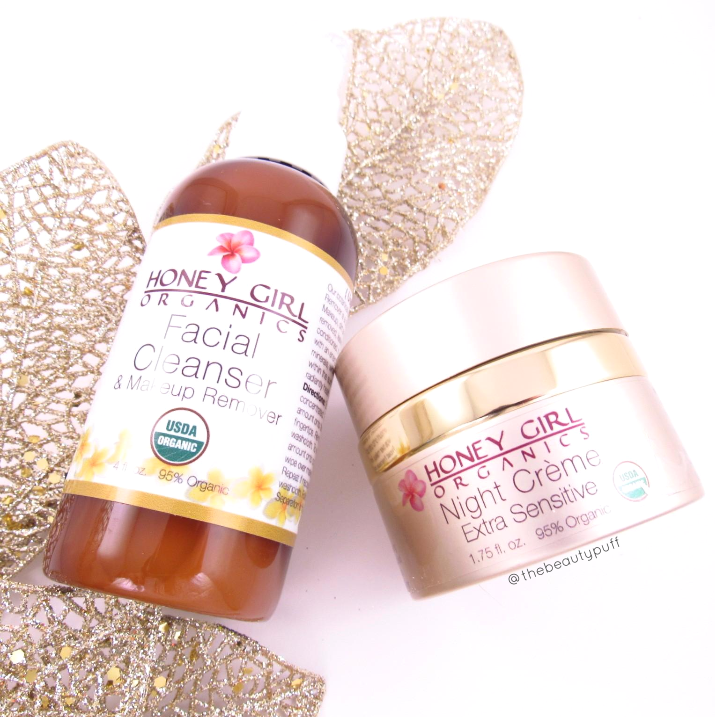 The first thing you need to know about using Honey Girl Organics products is that you don't need to use much at all! Also, with the cleansers, have a damp washcloth handy when you rinse your face to remove any excess product. Their Facial Scrub is one of the most hydrating scrubs I've ever used! Not only that, it has super fine cane sugar which exfoliates effectively and gently. It is much smoother than any other scrub I've tried because you don't feel as much "grit" if that makes sense. It also has nourishing ingredients such as aloe, raw wild flower honey, and coconut oil. After rinsing off the scrub, I use a damp wash cloth for any remaining oil. For an all-purpose daytime moisturizer, the Face & Eye Creme is perfect for this time of year. It hydrates with olive oil and vitamin E and feels incredible on the skin. This extra sensitive version, unlike the original version, does not have essential oils or fragrance. As I mentioned before, a little goes a long way! This is a very rich, hydrating cream. I only swirl my finger in the product a few times at first to be sure I don't apply too much. I allow it to thoroughly soak in before moving on in my beauty routine. 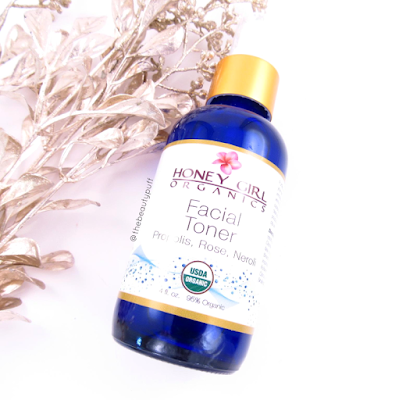 At night, when it's time to remove my makeup or just cleanse my skin, I use the Honey Girl Organics Facial Cleanser. You simply shake the cleanser and apply a small amount to your dampened face. I use about one pump and that seems to do the trick. As with the Facial Scrub, use a damp wash cloth to remove any excess cleanser. What makes this cleanser so rich? It has olive oil which gently removes makeup, even mascara, while leaving the skin hydrated and smooth after each use. It's a very gentle cleanser that I will definitely enjoy as my skin gets more sensitive in the cold winter. For an ultra-hydrating option before bed, the Night Creme will provide intense moisture while also providing anti-aging benefits. I have the sensitive skin version which doesn't have oils with fragrances so there's no worry about any irritation. This cream supports collagen production and diminishes the look of fine lines and wrinkles. The tiniest bit goes a long way, so start with a small amount until you get used to the richness! On days I do not wear makeup, I would wear this for an extra boost of hydration too. My absolute favorite product from the Honey Girl Organics line has to be their Facial Toner. There's nothing better than the feeling of clean, refreshed and soothed skin first thing in the morning, or after a long day. After using the cleansers mentioned above, I always follow up with this toner. It is incredibly gentle, while providing hydration and also balancing oil production. It also stimulates blood flow which reduces puffiness. After shaking it, you can either spray it directly on your skin or use it with a cotton round, which is how I prefer to use it. It removes any excess dirt without being harsh or irritating. According to the website, men can even use it after shaving! Quite the multi-purpose product. Not to mention it's gorgeous. I love all the packaging of Honey Girl Organics products!